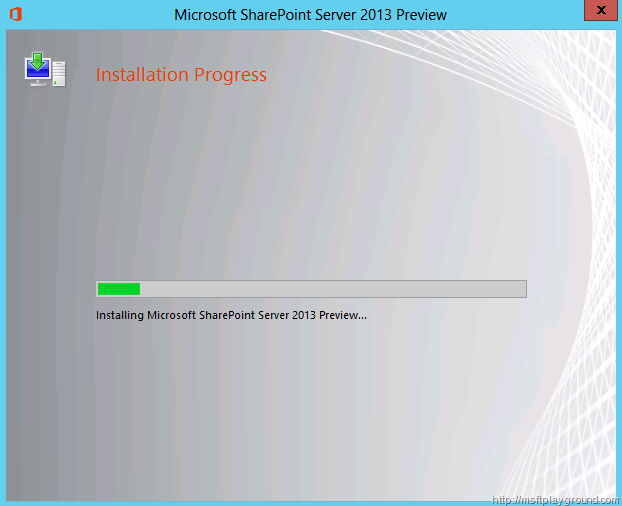 Now that the prerequisites are done it is time to start the installation of SharePoint 2013. First off we will have to some configuration changes. The first thing we will do is creating a farm account to run Central Administration and the farm services. 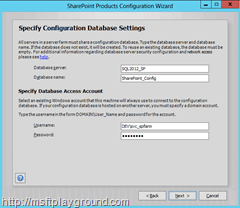 Next up is the configuration of a SQL Alias. 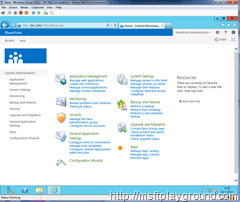 We will create a SQL alias to be able to migrate the SQL Databases to another Virtual machine if we want. With the Start Menu open use your other mouse button and select “All apps”. Open “Command Prompt” and type in cliconfg. 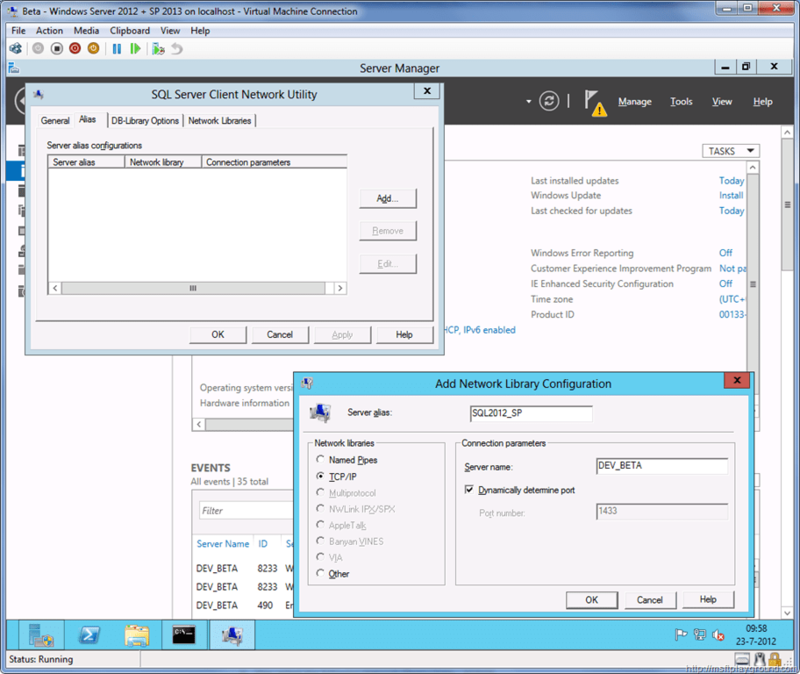 Within SQL Server Client Network Utility go to the Alias tab and click add. 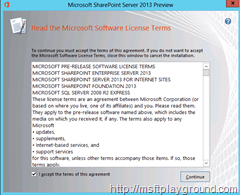 Type in a Alias Name (SQL2012_SP) and fill in the server name of the server that host SQL in our case it will be the local machine. 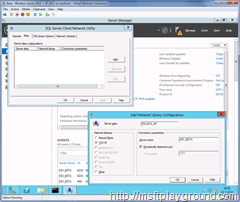 Also select the following Network library type : TCP/IP. 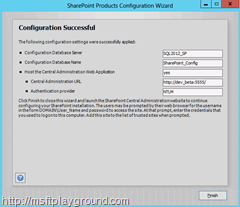 Select “Ok” to add the alias and select “Apply” and “Ok” to close the configuration wizard. 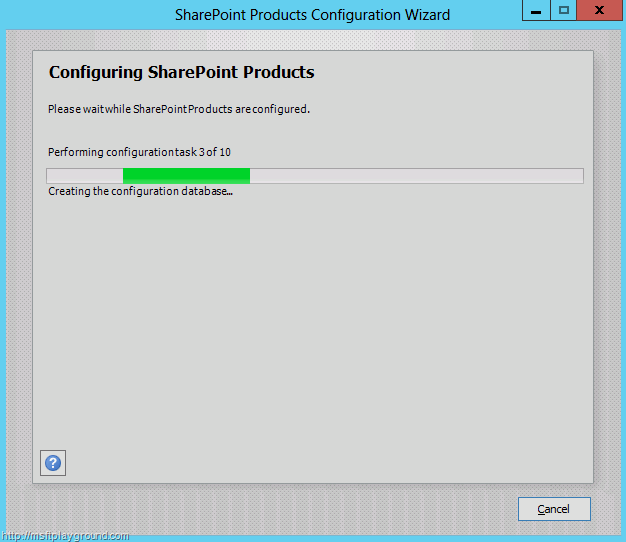 With these configuration steps done it is time to mount the image and start the setup of SharePoint 2013. 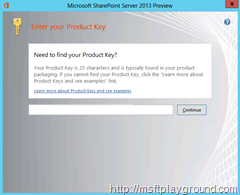 During the first step of the installation you will have to insert you product key. 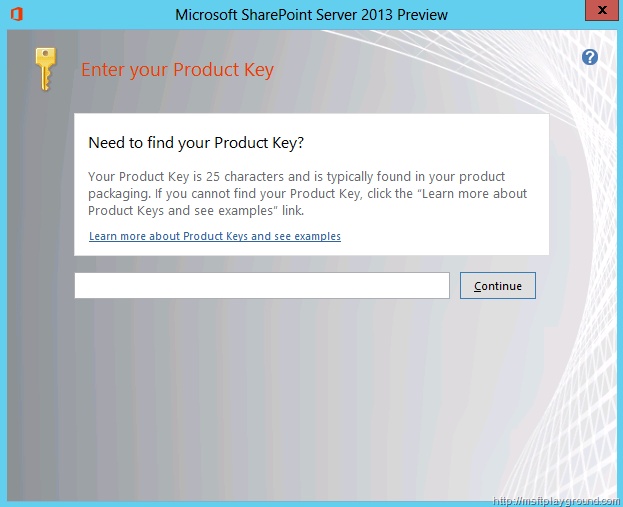 I received my product key to mail. Fill it in and press “Continue”. 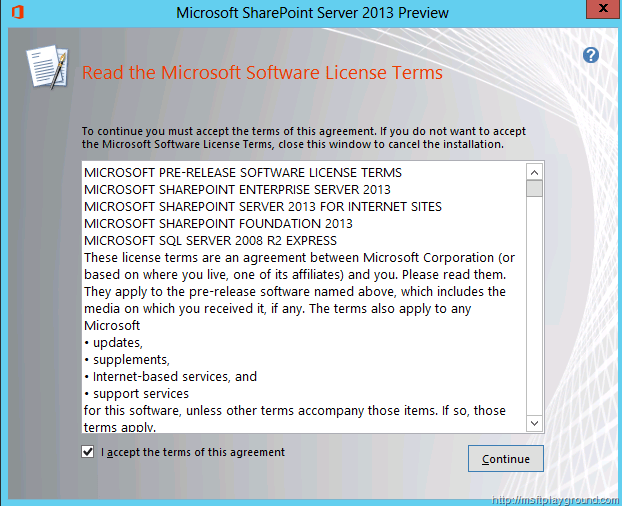 Accept the license terms and select “Continue” again. 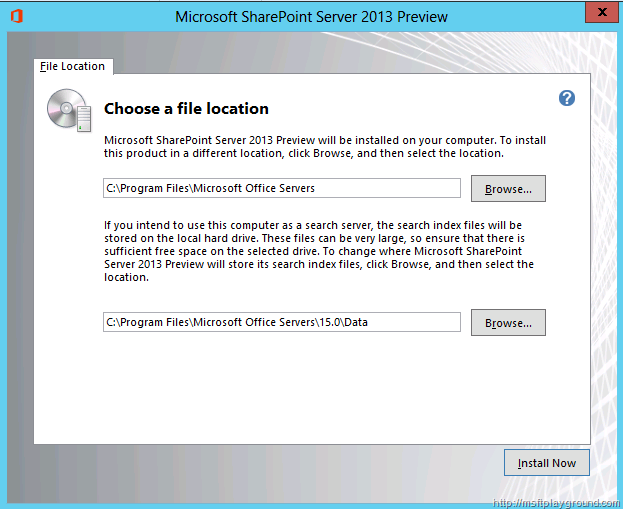 The next screen will give you the option to change the file location. For this machine we will leave it to default and start the installation. 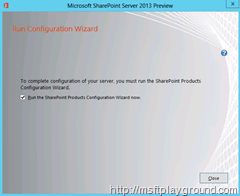 When the installation is finished the “Run the Configuration Wizard” screen will open. Leave the check box checked and click “Close”. 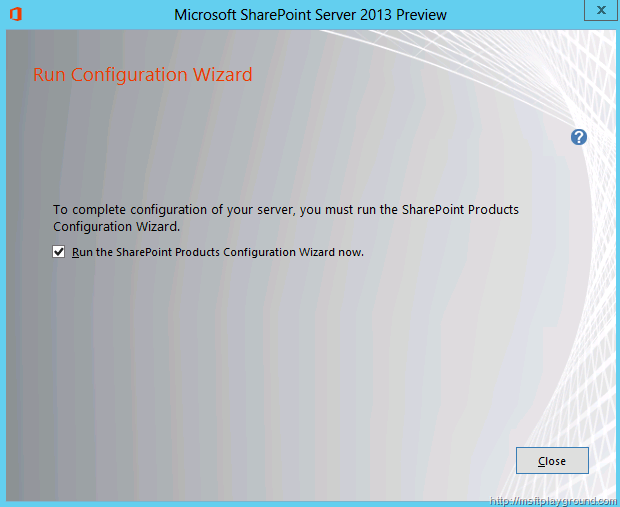 The configuration wizard will be opened. On the welcome screen click “Next”. 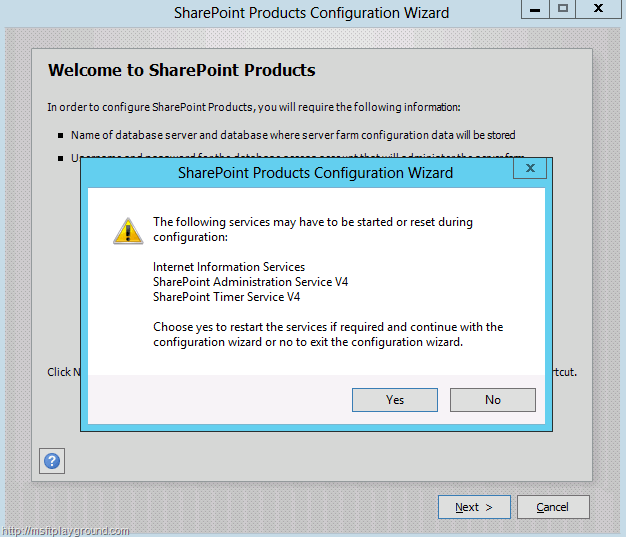 When you click next the same warning screen will appear as it did with SharePoint 2010 since this is a new installation we can ignore this message and click “Ok”. 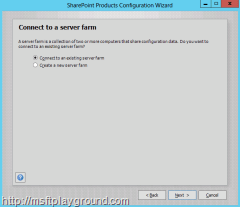 The next step gives you the option to connect to an existing farm or to create a new server farm. 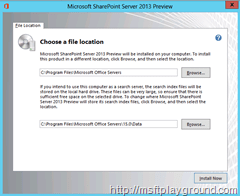 Since this is a new installation we will select “create a new server farm”. 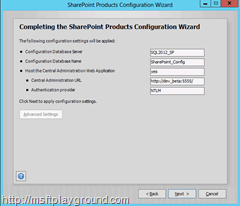 In the next step we will to specify the SharePoint SQL server and the name for the configuration database. 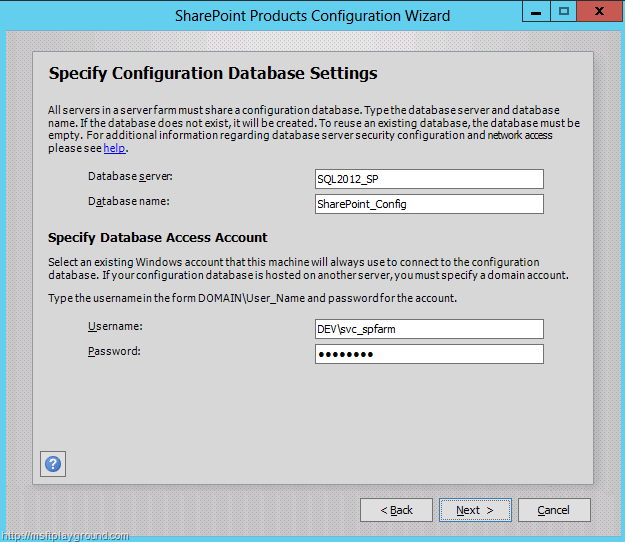 We also need to specify the Database access account. 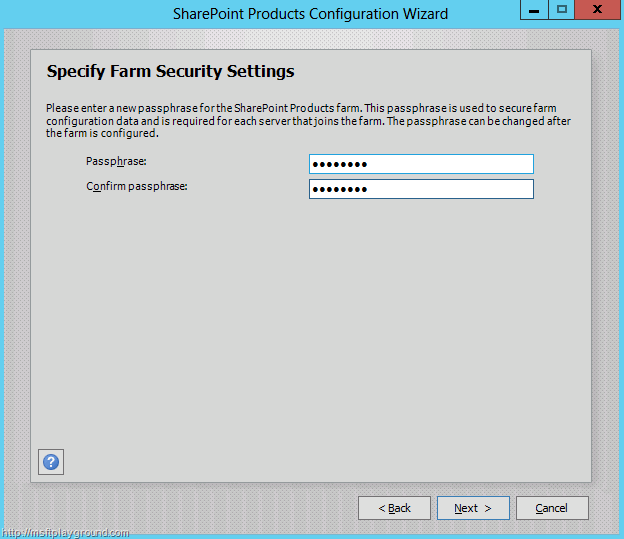 On the next step we need to specify the passphrase we want to use when we want to add another server to the farm. Use a a known password that you will remember and click next. 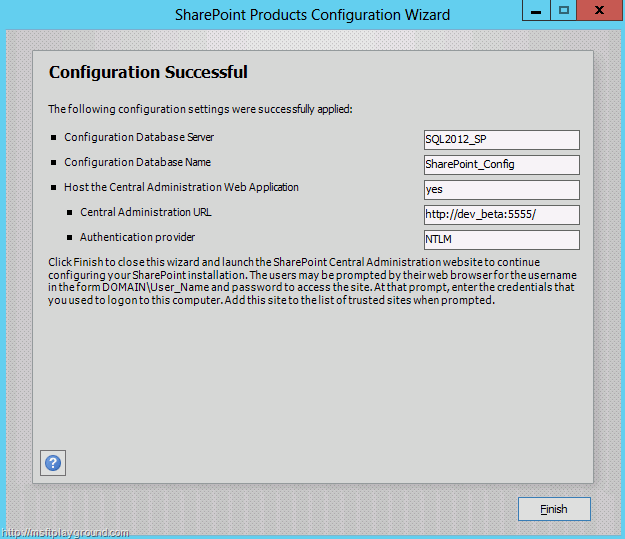 The next step in the wizard will allow you to configure Central Administration. 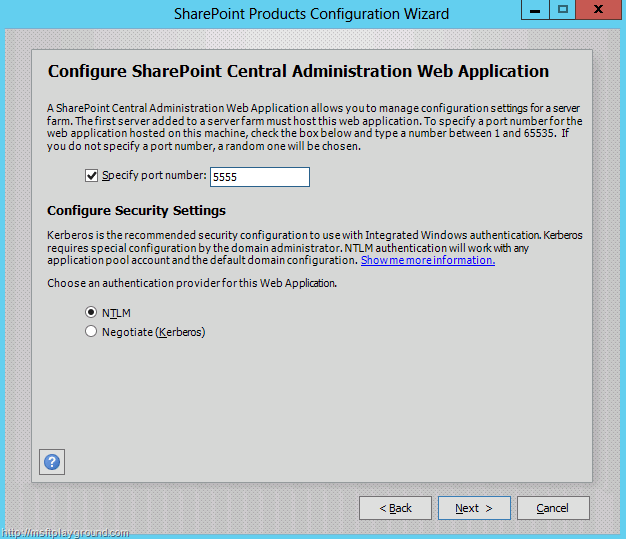 Use a port number u find handy and select NTLM authentication for this demo machine. A summery of the configuration will follow. 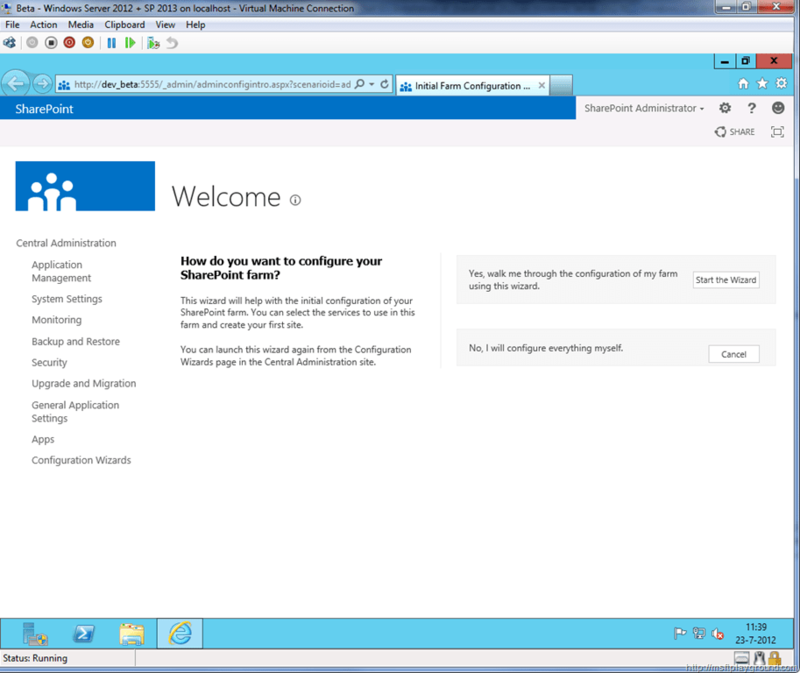 Check all of the settings and click on “Next” to start the configuration. 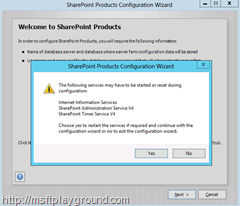 When the configuration is finished the successful window will be shown. 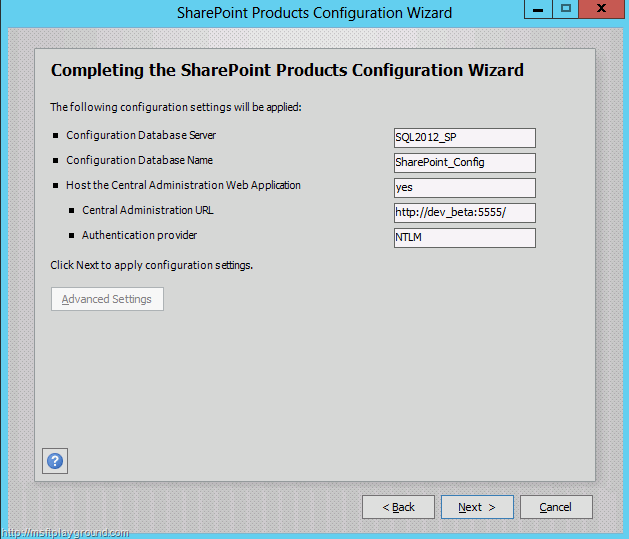 Click finish to close the wizard, automatically a explorer window will be opened that opens Central Administration. 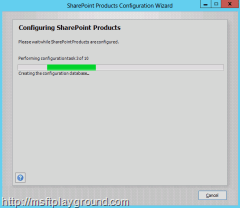 With a model dialog asking if you want to help improve SharePoint. Select “Yes, I am willing to participate” and click “Ok”. 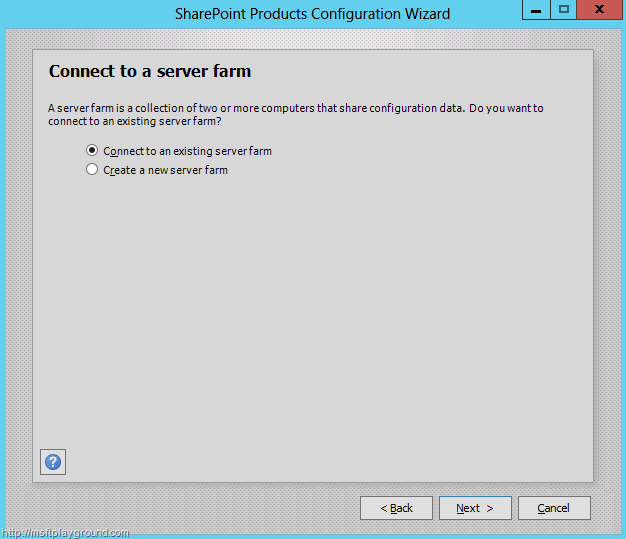 When the model dialog is closed you will get the option to start the configuration wizard to configure the farm. Select the option “No, I will configure everything myself”. The Central Administration home screen will be opened. 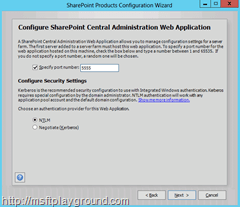 In the next post we will start the configuration of the different SharePoint 2013 Services. Did you forget a step? 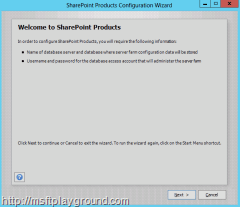 The database might not exist, or the current user does not have permissions to connect to it. 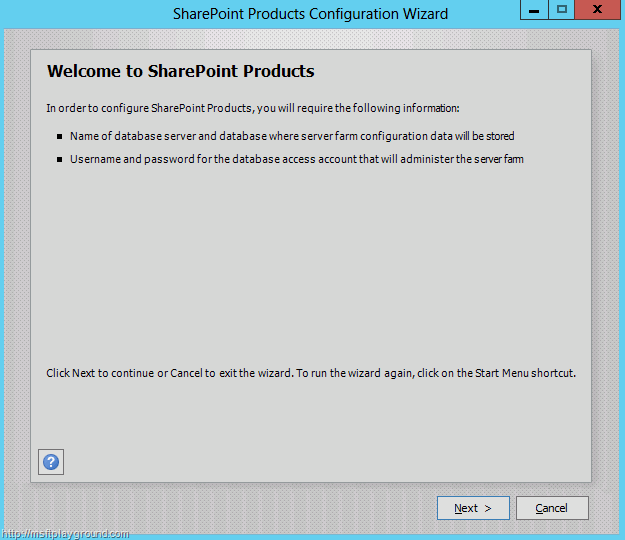 Nick: Please check the rights of the account you are using to run the configuration wizard and if it has rights on the SQL Server. Also check the spelling off your alias. I’m all caught up and waiting for the next part to continue this journey. Thank you for the great posts so far. They’ve worked just great when you follow them step by step. I get the same issue as Nick. I don’t see instructions how to configure the svc_spfarm with SQL Server. 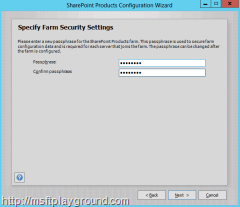 The general practice is that sp farm account should not be domain admin, but just have minimal set of permissions to run the services and access AD. Any guidance would be appreciated.